This week was a busy one at Kilcoole. Early in the week there was a large influx of adult terns into the colony, with max counts of over 250 individuals. This lead to great excitement amongst the wardens over this fresh potential for a large number of new nests. The large number of adults is also an advantage for the terns because they are better able to mob avian predators. A substantial number of terns started to lay eggs and build scraps to the south of the protective predator fence. On Wednesday morning wardens were busy at work extending the fence future south as far as the breaches outlet to incorporate these new nests which would otherwise have been exposed to a number of mammalian predators. By weeks end, the number of nests was up to 84, and included just over 200 eggs! Wardens continue to find new nests daily and this number is estimated to continue to grow well into next week. Thursday afternoon saw the first cracks beginning to appear in the first nest that was discovered 21 days ago. 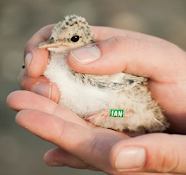 Much to the warden’s delight, early Friday morning, there were two fluffy tern chicks freshly hatched in the nest. This nest was a very early layer and it is expected that no more eggs will hatch for another 3 or 4 days, and with a large bulk of the first batch of eggs hatching on the 19th and 20th of June. Two nests of Ringed Plover also hatched on Friday morning, with 4 chicks each. Unlike the terns these Ringed Plover chicks run off the nest on their very long legs to hide in the shingle mere hours after hatching! As a species, Ringed Plovers are very promiscuous, and chicks learn to feed and take care of themselves very quickly. All that was seen of these little chicks was the broken bits of shell which they had escaped from earlier in the morning. The Little Terns, however, require a lot of parental care and rely on their parents for food right up until fledging. We will be seeing a lot of this around the colony soon as all our eggs begin to hatch! Ringed Plover up and ready to run before his brother even hatches!